The plight of sea turtles in the Pacific has captured the attention of scientists and conservation practitioners around the world. Their fate lies heavily in the hands of indigenous or local communities who are often the users and primary stewards of these endangered species. The need to take action to improve stewardship of turtle populations, with emphasis on management of human interactions with turtles, has become apparent. Culture and conservation can clash when endangered sea turtles are harvested as a part of ancient and deeply help traditions. 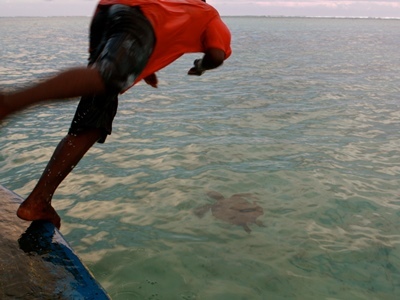 Through community engagement, however, local villagers can sustainably manage and conserve sea turtle populations. This project seeks to engage local landholders on Kolombangara Island in the creation of a locally driven sea turtle monitoring programme. To do this, we will research Kolombangara’s sea turtle populations, develop the capacity of community members to assess and monitor sea turtle populations, and raise awareness within indigenous communities to engender a commitment to sea turtle conservation. Through the creation of a community-based monitoring programe, this project will empower local communities to manage their resources, laying the foundation for long-term marine turtle conservation.